Sweet potatoes—with this nice fall weather, we’ve been enjoying our favorite fall soup recipe: Spicy Sweet Potato Soup with Greens. Cabbage—Everyone received a head of our green cabbage which is fantastic in asian soups, stir fries, with sausage and potatoes, or in traditional slaws and sauerkrauts. Mixed greens—Everyone received a bag of mixed brassica greens, collard, kale, broccoli greens, etc. Excellent braised. Cauliflower—For large shares. The first of the cauliflower is ready! This crop is especially tough to grow, so we’re always excited about it. Enjoy! Persimmons!—Our young persimmon trees are giving us their very first fruits this year and they are delicious. They should be nice and soft when fully ripe, so let sit out on your counter for a day or two if needed. (When under ripe they are very bitter) Slice and enjoy on a cheese board, in a salad, or just eat it right up. Purple Top Turnips—The traditional way to cook southern turnips is to sauté your chopped roots in butter or bacon fat with garlic and onion for a few minutes, and then toss in the chopped greens to cook a few minutes longer. Add hot sauce and you’ve got an authentic southern mainstay. Alternately, try them roasted or in a mixed-veggie mash with butter and salt. Winter Squash—Everyone received a butternut squash, and the small shares also received a delicata squash and the large shares received an heirloom pumpkin! Many of them did not have time to fully cure before the first frost so they will not store very long. Keep them in the fridge and use within 2 weeks. Sweet potatoes will prefer to stay at room temp. Everything else will keep longest stored in the fridge. All root crops should be severed from their tops to keep the roots from getting rubbery. Everything will need a gentle washing before cooking, but leave the dirt on until you’re ready to use them to prevent spoilage. 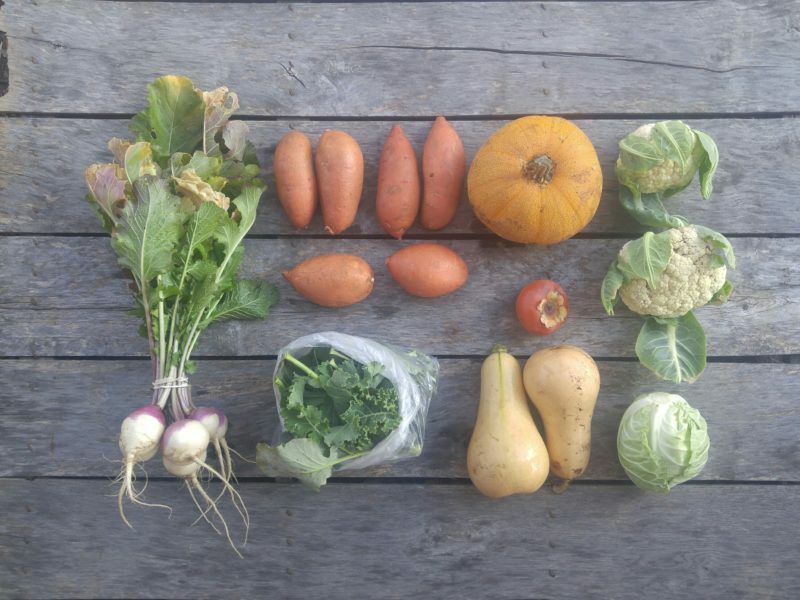 Large Share: (top left to right) Purple top turnips, sweet potatoes, pumpkin, and cauliflower (persimmon just below the pumpkin). (bottom row) bagged brassica greens, butternut squash, and cabbage. 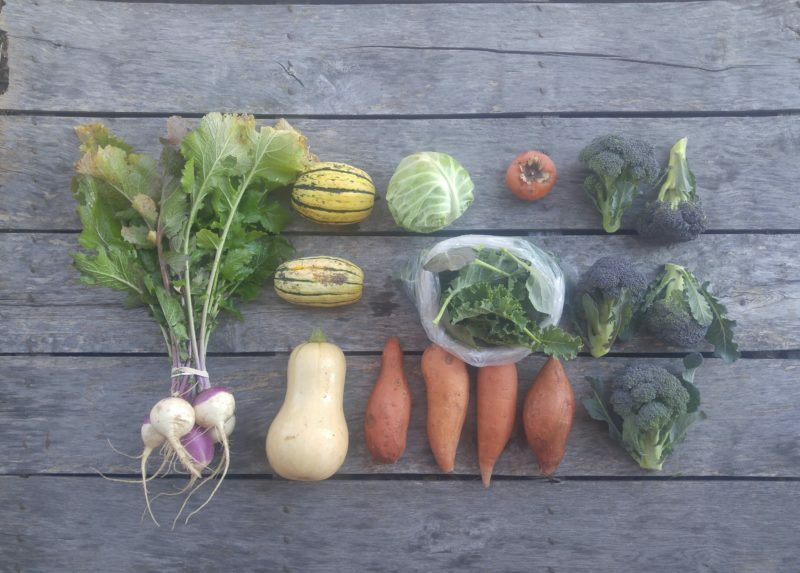 Small share: (top left to right) purple top turnip, delicata squash, cabbage, persimmon, broccoli. (next row) Butternut squash, sweet potatoes, and bagged brassica greens in the center of the image. We made this instant pot chicken with pumpkin, butternut squash, and turnips from last week’s CSA. It was so delicious! The recipe also has an adaptation for a slow cooker. I hope your family enjoys it as much as mine!